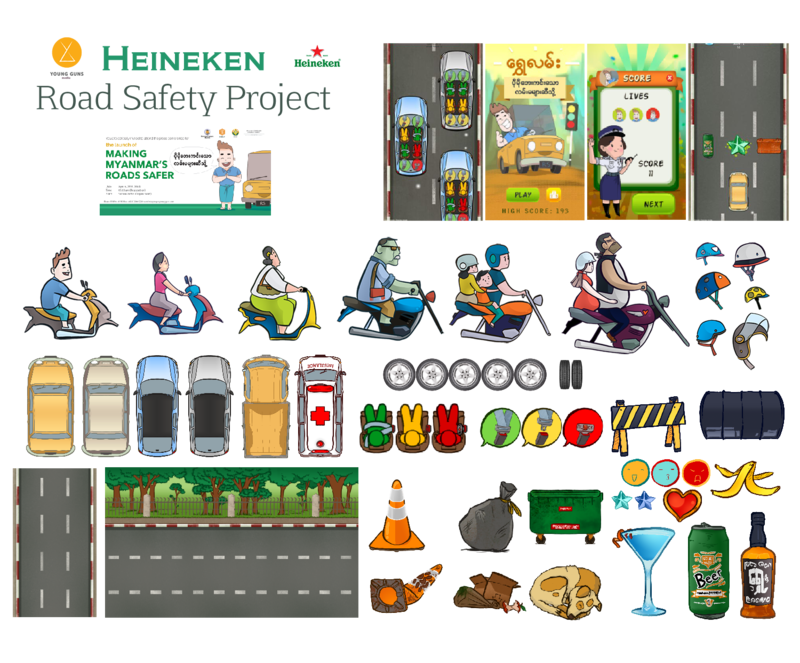 I was hired to develop 2d assets and assist with gameplay troubleshooting/UI elements for a suite of mobile games to promote safe driving habits for the peoples of Myanmar. I was provided a rough branding guideline and character design sheets so as to stay on-model. This initiative was funded by Heineken, with progamming development by Young Guns Media - Yangon, and coordination of efforts provided by Paavo Media, UK. 7 mini games 3 levels: easy, hard and insane Play offline – just download, log in once and you’re good to go Share scores on Facebook Compete against your friends A music track you’ll be whistling for days FREE TO PLAY! Want to do more to prevent thousands of deaths every year on Myanmar’s roads? Join the Making Myanmar’s Roads Safer campaign at https://www.facebook.com/RoadSafetyMyanmar. Like the page, share the posts and raise awareness of crucial road safety behavior. Shwe Lann is part of Making Myanmar’s Roads Safer, supported by the Ministry of Road Transport Administration Department (RTAD), Ministry of Transport and Communications, Ministry of Home Affairs, Ministry of Construction, Ministry of Information, Ministry of Education, and Ministry of Health and Sports, working jointly with The APB Alliance Brewery Company. To find out more, visit: https://www.facebook.com/RoadSafetyMyanmar Watch out for the campaign on billboards, TV ads and cinemas near you!